These Gluten-free Almond Oat Cranberry Bars are an easy one-bowl recipe and are great for a healthy breakfast, dessert, or snack! Do you ever buy food or ingredients on a whim? Or is that just a #foodbloggerproblem? That’s exactly what happened with the cranberries I used for these bars. I saw a bag of organic cranberries at the grocery store, and even though I wasn’t hosting Thanksgiving this year and had no plans for them, I wanted them. They were so pretty and festive, I couldn’t help myself. I decided to bake with them. 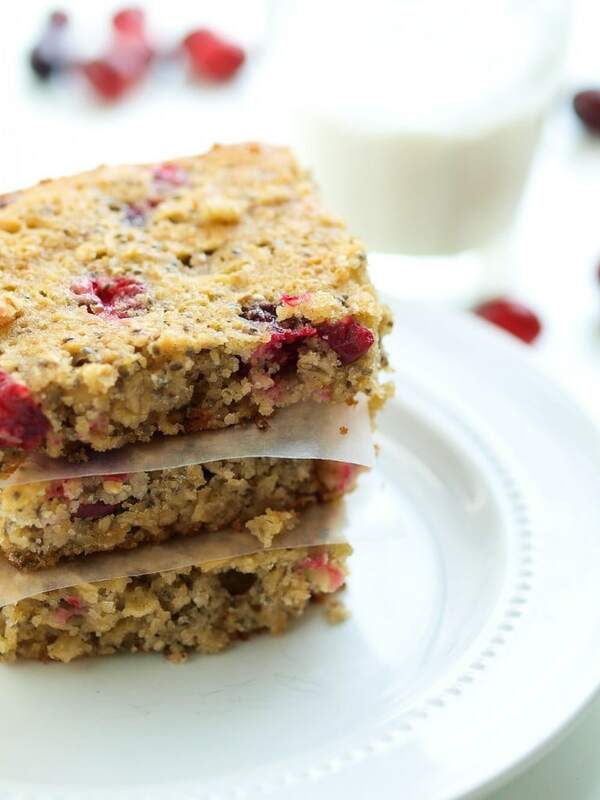 These healthy bars, with fresh cranberries, are the result of my impulse purchase. Sometimes impulse purchases turn out pretty well. I’m so happy with these bars! I used a mix of almond flour and old fashioned oats, so you get a lower-carb bar that is lightly sweet and really satisfying. 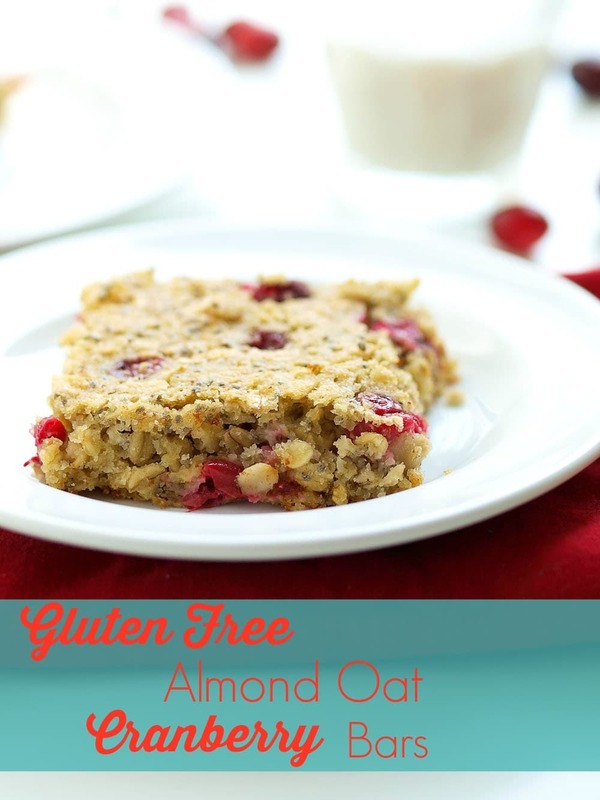 They are great as a breakfast bar or for an after-school snack. For one batch I added dark chocolate chips. That takes these bars to a dessert level. I highly recommend it. Along with being gluten-free, these bars are also dairy-free. I should have put that in the title, but I thought it was long enough as it was. I did use two eggs for these. With one trial I used one egg and they didn’t hold together that well, so I’m not sure how these would work with flax eggs. I also used two tablespoons of chia seeds, which add another boost of nutrition, but they are optional. These bars could not be easier to whip up. You only need one bowl. Mix it all together and you’ll have some healthy, delicious bars in no time! Although some of the pictures have forks, no fork is needed. These make a great portable breakfast/snack option if you need that. I hope you love this recipe! 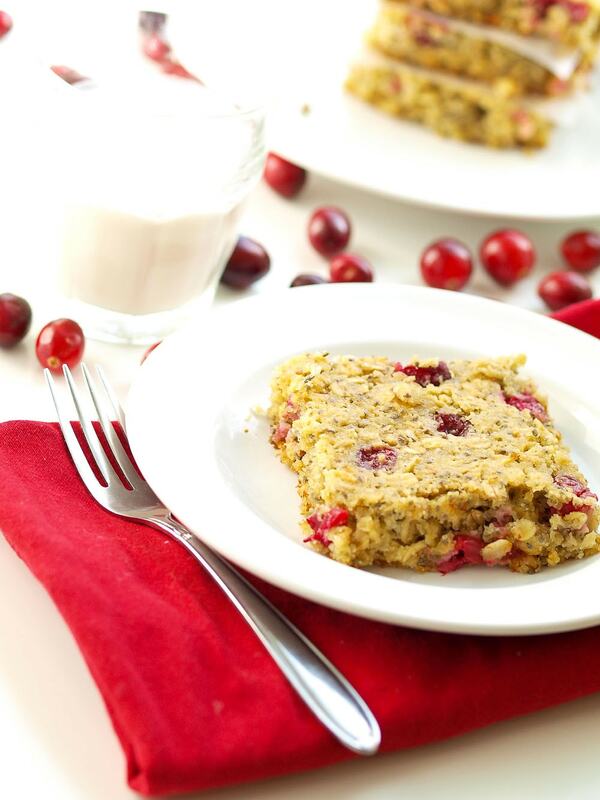 These gluten-free Almond Oat Cranberry Bars are healthy enough to eat for breakfast, but can also be a great dessert! In a large bowl, whisk together the almond flour, oats, baking powder, baking soda, chia seeds, and salt. Create a well in the middle and add the orange juice, oil, eggs, and honey. Stir until everything is combined. Add the cranberries and chocolate chips (if using). Transfer the batter to your baking pan. 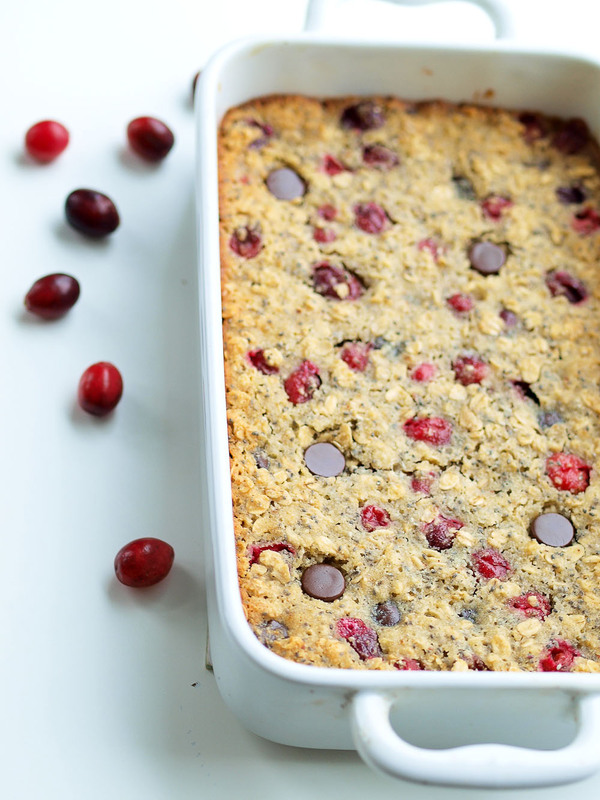 If the cranberries are bunched together, use your fingers to distribute them evenly among the batter. Bake in the preheated oven for 25 minutes, until the top is lightly golden and the edges are pulling away from the pan. Allow to cool completely before cutting. Enjoy! Thanks Kathy! 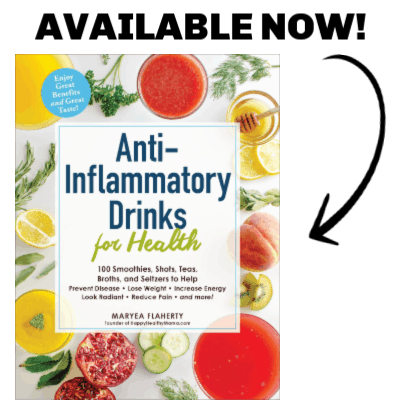 Please let me know if you try them with a flax egg–I’d love to know if they work. If you could only have one cookie which would it be? The #1 most popular cookie will be revealed on Saturday, December 6th, 2014. Should be fun! Happy Baking!! Those look amazing and so easy to make. I pinned it to make soon! Perfect! I think it’s meant to be. Yum! These look SO good! May have to make these. These sound amazing. My kids would love them! Love this variation! can’t wait to try it! Thanks Jennifer! I hope you love it if you give it a try! I think the buying food or ingredients on a whim is a #foodbloggerproblem and a foodie thing.. but it’s a good problem to have. . esp when it results in fabulous bars like these!!! love!! and love the almond flour!! I agree–not a bad problem to have at all! They look so good and I have everything in my pantry already! I think our Elf On The Shelf needs to “make” these for the kids this afternoon. They look fantastic! I doubled the recipe because I was making this for a party and put the batter in two 8×8 square pans. My oven was preheated to 350 – with a thermometer measure but at 25 minutes the middle of the pan was complete liquid and the edges were dark brown. Even ten more minutes wasn’t enough. Any ideas? Oh my! That doesn’t sound right at all. It definitely sounds like something was off in the measuring, but I can’t say for sure since I wasn’t there to see you baking. I have made these several times with no issues like that, but I’ve never doubled the recipe. I wish I could help you more! What can I use as a substitute for the orange juice? I don’t regularly buy it and don’t want to buy it for such a small amount for the recipe. You could always use an orange and use fresh orange juice. If that’s not an option, I think almond milk (or your milk of choice) would work as a liquid substitute here. When you say 350 degrees -do you mean Fahrenheit? My oven operates in Celsius and I ended up burning the batch! Yes, I mean Fahrenheit. I live in the US and all of our temps are in F.